Easily create birthday eCards and wedding or employment anniversary eCards and schedule them to be sent on your contact's special day. 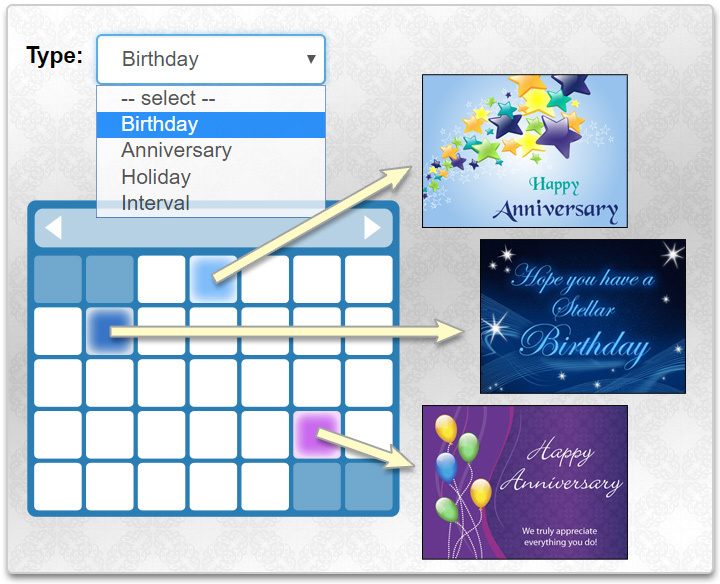 To ensure you never miss sending a birthday card or anniversary card, you can also use our Recurring eCard tool that completely automates the process of sending your eCards year-after-year. If you want to use your own anniversary and birthday card designs - no problem! You can upload your own photos or digital artwork and send it using our eCard sending and tracking tools. 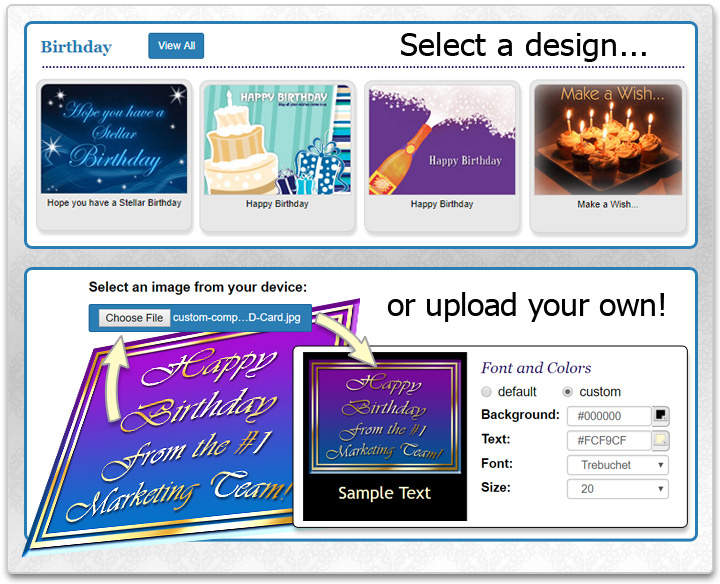 Choose one of our designs or upload your own photo or artwork to make a birthday or anniversary extra special. Send your eCard right away, schedule it for a future date, or automate year-after-year as a 'Recurring eCard'. CorpNote's Recurring eCard tool lets you completely automate the process of sending birthday and anniversary cards, holiday cards and any online marketing campaign that you can dream up to build your business. 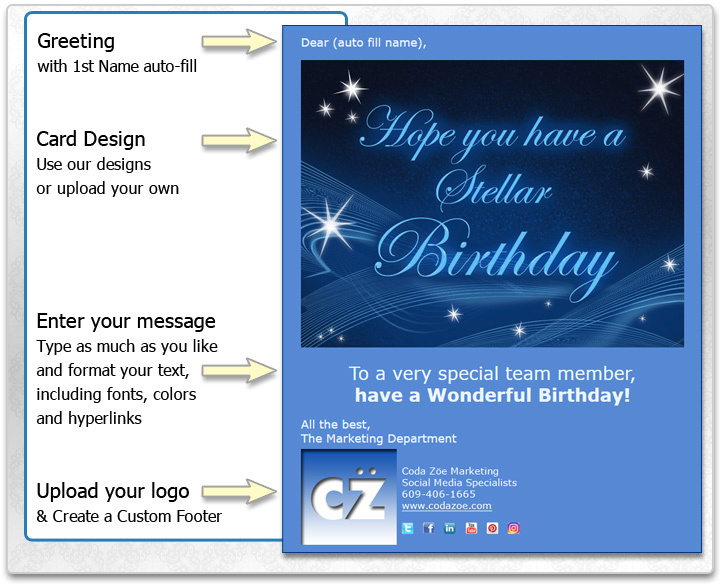 Learn more about how to automate the sending of eCards - month after month and year after year. Import contacts to your CorpNote Address book with birth dates, anniversary dates and employment start dates. 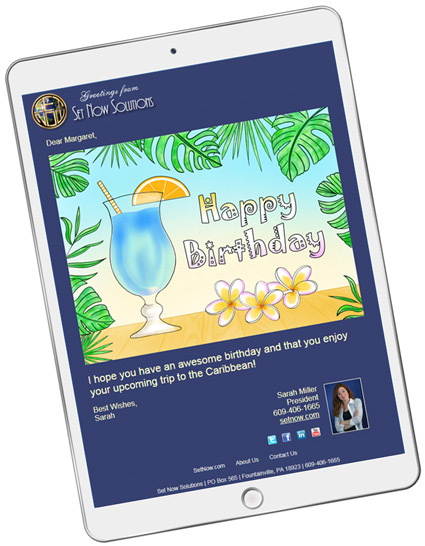 Easily schedule your birthday and anniversary eCards to go out on your contact's special day. Use our recurring eCard feature to set a series of different eCard designs to be sent each year. View real-time stats on when the eCard has been viewed. Anniversary and birthday eCards can easily be made into an Online Invitation, so you can effortlessly electronically manage a party or event from start to finish. Membership includes unlimited, advertising-free eCards, invitations and surveys. We provide free support through our online contact form or you can reach us by phone Monday - Friday, 9am-5pm E.S.T. "I just found out yesterday that my teaching assistant's birthday is TODAY! So not only would I not have had time to send a physical birthday card, but I don't have his postal address... I found CorpNote and chose to send a professional eCard ... AND I can use it again and again for all my business needs."